Security, by its nature, is sensitive. That means that not everyone is happy to discuss the details of their security over the phone. Plus, many people want to see who they are talking to and the quality of the equipment a provider proposes to use. That’s why we invite any customer who feels this way to come and see us. 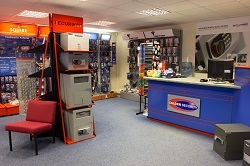 Our security shop in Wakefield is open 8.30-5.00 and it’s always staffed by a fully qualified security engineer. Therefore, if you do like to discuss things face to face you can come in whenever you like during opening hours, without any need to make an appointment. We’re not just here for advice either; we have a key cutting workshop, we offer a range of safes for sale and stock other lock and door items. We have quite a number of customers who began their relationship with us just by coming in periodically for key cutting or to buy locks. Over time they’ve asked us for advice and seen the set up that we have here and gone on to buy their intruder alarms and/or CCTV systems as well. One of the big advantages of coming in is the demo equipment we have. We can show you a CCTV system in operation so you know exactly whether it will meet your needs and what’s involved in using it. Most significantly, it offers you reassurance about the kind of company that we are. With our permanent, open-to-the-public premises we’re fully accountable for everything that we do and you can come and see us and ask our advice any time without any obligation. We’re just outside Wakefield city centre and you can park right outside so if you want to see who you’re dealing with just pop in and see us. For full location details click here. previous Yorkshire: The Place-to-Be for Burglars?